When 1959 rolled around, the Chevrolet Impala was in its second year of production, and already received a redesigned. In a move to cut costs, GM was sharing body shells through its divisions, so the Impala, some Buicks and Oldsmobiles, and even some Pontiac cars used much of the same structure. A new X-frame was utilized, the roof line was 3 inches lower, the bodies were 2 inches wider, and curb weight increased from 1958. But, the design feature that stands out to this day are the car’s tailfins. Previous automotive designs had the fins standing up, but the ’59 Impala fins laid down like a pair of wings, and the taillights were now the shape of an elongated oval. These sleeker, pointed taillights became known as “cat’s eye” taillamps. Sport coupes featured a shortened roof line and a wrap-over back window that that not only complemented the compound-curved windshield, it promised a virtually unlimited rear sight line. The Impala became a separate series this year, adding a four-door hardtop and four-door sedan, to the two-door Sport coupe and convertible line up. The standard engine was an inline six-cylinder, while the base V8 engine was the 185 horsepower 283 cubic-inch engine. There was however an optional 283 cubic-inch engine delivering 290 horsepower. The W-headed 348 cubic-inch V8 was the top-of-the-line engine choice. The upscale car offered standard interior features like front and rear armrests, an electric clock, dual sliding sun visors, and crank-operated front vent windows. A contoured and hooded instrument panel held gauges that were recessed into the dash, and in keeping with the upscale theme, the driver enjoyed the new Flexomatic six-way adjustable power seat. With the flick of a switch, the driver could move their seat forward or backwards, and up or down. In an attempt to help keep drivers conscientious of how they were driving, a Speedminder alarm was installed. The Speedminder allowed the driver to set a needle at a specific speed on the speedometer, and a buzzer would sound if that speed was exceeded. If purchased with a six-cylinder engine the ’59 Impala convertible cost $2,849 but a V8 engine added $118 making it $2,967. Article courtesy of Rod Authority, written by Randy Bolig. The brainchild of custom car designer and builder Randy Grubb, this all aluminum beauty features classic art-deco styling and a powerplant to turn heads. According to Randy, “powering this particular vehicle is a Detroit diesel 12V71, two-stroke diesel. It’s a very unique motor, 12V71, meaning each cylinder is 71 cubic inches.” He continues to explain “Those two 671 superchargers inline are stock.” Despite the massive displacement, and forced induction systems, Randy clarifies that this is the lower horsepower version of this Detroit engine, at around 500 hp, and 1,000 lb-ft of torque. The uprated version featured turbochargers feeding the superchargers. A four-speed Allison transmission, from a tour bus, transfers the power to the ground. The 351 Peterbilt cab, was chopped and sectioned five inches in the B-pilar, and eight inches in the A-pilar to give that classic raked look. The seats are custom upholstered in saddle leather, and demonstrate old-world craftsmanship with ornate designs and stitching. The rear leaf springs are mounted to the frame rather than the axles for un-sprung weight. The suspension of this Peterbilt is far from original. “Well the springs are a rather unique approach, they would be termed a quarter-elliptical. We’ve got it mounted on the frame which is kinda unique, rather than putting the spring on the axle which would be carrying it in an unsprung-weight situation, we’ve moved it up onto the frame so that it is part of the sprung-weight now, which makes the car handle a little better.” The front axle is a GMC 7000 series beam that Randy cut nine inches out of to narrow the track width and keep the sleek stance. Sleek and Peterbilt are rarely found in the same thought but in this case it has been achieved. Hand tailored saddle leather seats bring more hand-made touches to this truck. Article courtesy of Rod Authority, written by Trevor Anderson. Photos courtesy Ford Motor Company. In addition to eschewing the Lincoln brand name for the Continental Mark II, Ford Motor Company executives initially declined to assign model years to the Mark II, arguing that the halo car represented luxurious timelessness. Time, however, has a way of catching up to even the most timeless of cars, as evidenced by today, the 60th anniversary of the public debut of the Mark II. The original Edsel Ford-envisioned Lincoln Continental proved a tough act to follow; after all, it set the tone for American luxury automobiles upon its introduction in 1939 and fired the imagination of designers from Walter Dorwin Teague Jr. to Frank Lloyd Wright. Lincoln itself even declined to replace it after 1948, letting its distinctive grace – not to mention its V-12 engine – lapse from dealership showrooms. Ford designers made a handful of drawings for a 1949 or 1950 Continental and the X-100 concept car seemed to promise a gadget-laden Continental of the future, but those all came to naught. Bill Ford with a 1956 Continental Mark II. The absence wouldn’t last forever, though. In 1952, thanks in large part to the influence of William Clay “Bill” Ford, Edsel’s son and a director of the company since 1948, Ford began preliminary work on establishing a new division, the Continental division, that would build a successor to its namesake, a car intended from the start to represent the pinnacle of American luxury and compete with Chrysler’s Imperial and Cadillac’s Eldorado. As manager of the Special Product Operations, Bill Ford then handpicked a team to guide the new Continental into existence: John Reinhart, who worked under Bill Mitchell at GM and later served as chief stylist at Packard; Harley Copp, who would later go on to engineer the Ford Falcon, as chief engineer; and Gordon Buehrig, Cord 810 designer; as chief body engineer. He secured the recently vacated building that housed the Henry Ford Trade School, separate from any other Lincoln or Ford design studios and engineering departments, for the development work as well as a dedicated manufacturing facility in Dearborn where the cars would be hand-built. While the Mark II emerged as a two-door, four-passenger hardtop only, it nearly had a couple other bodystyles join it when it bowed on October 6, 1955, at the Paris Auto Show. Keeping in line with the original Continental, Ford’s team naturally proposed a convertible, but it also seriously considered Gil Spear’s idea of a retractable hardtop. A team led by John Hollowell and including Ben Smith ended up building one complete and functioning Mark II retractable – a prototype called the XC 1500 R, based on a cobbed-together 1953 Lincoln – before Ford’s team ultimately canceled both body styles and Ford division adapted the design to its own 1957 Skyliner. While assembly took place in Dearborn, the bodies of the Continental Mark II were supplied by Mitchell-Bentley of Ionia, Michigan, best known for supplying wood- and steel-bodied station wagons and fiberglass-bodied prototypes to Detroit’s automakers. Power came from Lincoln’s 285hp overhead-valve 368-cu.in. V-8 backed by Lincoln’s three-speed automatic transmission, but Continental touted the Lincoln drivetrain’s hand-assembled nature, with each bolt individually torques. With leather seats and power accessories standard, the option list consisted of just one item: air conditioning for $595. With air conditioning, the sales price of the Mark II topped $10,000 – at a time when a Ford Fairlane could be had for less than $2,500. First-year production came in at 2,550; for 1957, production tailed off to 444. As The Henry Ford noted, even at $10,000 Continental lost money on every Mark II sold – such is the nature of halo cars, after all – but that didn’t sit well with stockholders once Ford Motor Company went public in 1956. The far less expensive unibody Mark III, built alongside the Thunderbird on the Wixom assembly line, replaced the Mark II for 1958; the Continental division lasted a few years more before the Lincoln division reabsorbed the Continental series. The Continental as a model lasted until the 2002 model year. These days, the Mark II has gained near-universal recognition as one of the most stylish cars of the 1950s, a car that bucked the chrome-everything trend and thus showed off its natural elegance to great effect. A car that, though aged, still carries the same impact it did 60 years ago. Studebaker was first out of the gate with a freshly styled lineup in 1947, beating the GM, Ford and Chrysler competition that wouldn’t have truly new cars to offer until 1949. Those 1947 Studebakers—styled by Raymond Loewy‘s team, then including Holden Kato and Virgil Exner—would spark trends with their integral front fenders and wraparound rear glass. Their basic design remained in production through 1949, the last year Studebaker used a conventional grille design, before 1950-’51’s controversial “bullet nose” styling made the scene. The 1949 lineup was largely carried over, and included the low-priced Champion and premium Commander, both offered in Deluxe and Regal Deluxe trims and both with six-cylinder engines. Prices ranged from $1,588 for a three-passenger Champion Deluxe coupe to $2,467 for a Commander Regal Deluxe convertible, the rough equivalents today of $15,900-$24,700. 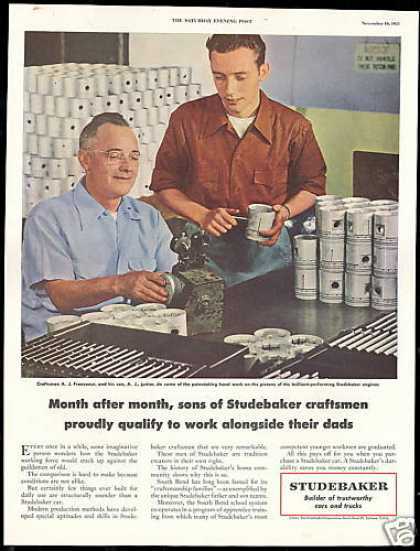 In this double-sided four-panel foldout brochure, Studebaker was keen to emphasize its long history (97 years!) and multi-generational family workers, which were also stressed in the firm’s print advertisements. Article courtesy of hemmings Daily, written by Mark J McCourt.